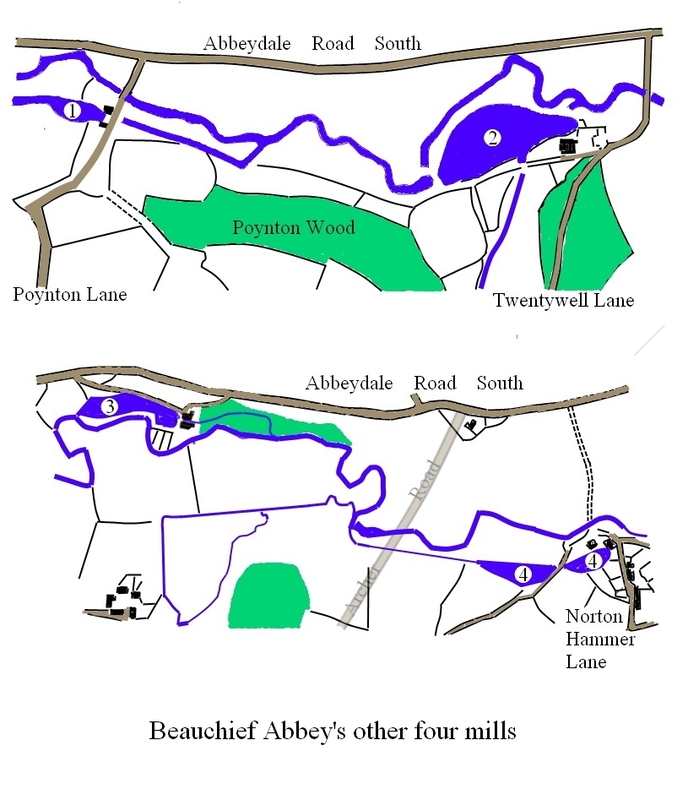 Beauchief Abbey’s other mills on the Sheaf. By the end of the fourteenth century, donations to the abbey were such, that its estate stretched from Storth House beyond Totley to Meersbrook, along the western banks of the river Sheaf, which falls from 450 feet to 300 feet in a space of five miles, making it ideal for the five wheels that the Abbey had on it by 1300. Four of them started life as corn mills producing flour, but the fifth (2) was a fulling mill. ‘Fulling’ is one of the final processes in cloth production; it involves the cleansing of cloth (particularly wool) to eliminate oils, dirt, and other impurities, and making it thicker by pounding the cloth with large hammers in troughs filled with a mixture of water, urine and ‘fullers earth’, causing the fibres to mat together or ‘felt’. Originally, this was literally pounding the cloth with the workers’ feet in a trough of water, hence, the local mill was known as the Walkmill. The Walkmill (2) situated on the edge of Poynton Wood at the bottom of Twentywell Lane, was erected c.1280 by the canons of Beauchief Abbey on land given by Sir Ralph d’ Ecclesall. In 1537, it was used for making cutlery and 1828 for making paper. It eventually found itself literally surrounded on all sides by railway lines and its last buildings were demolished in 1890. Bradway (1) c. 1300 granted to the Abbey by the lord of the manor of Alfreton for grinding corn. 1785 converted to scythe grinding; also closed in 1880 removed to make way for the railway. It lies buried under Brinkburn Drive. Moscar (4) Late 13th century it was. built on the Holt House estate on land owned by the Abbey as a corn mill. By 1496 it changed to cutlery manufacture adding scythes in 1511. By 1878 it had stopped working being finally filled in in 1956. The site can be seen from the entrance to Tesco. So, by the end of the 18th century, Ecclesall was left as the only mill on the sheaf producing flour for the local community, which it continued to do till 1939. How did that community live?